Youth services staff with Jessica Herriot from Bute in Bloom and members of the volunteer team who helped to clear a patch of waste ground next to the Lade in Rothesay. 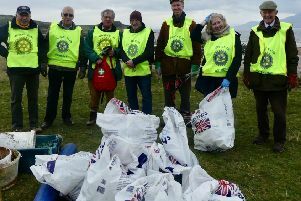 Community group Bute In Bloom has teamed up with the Argyll and Bute Youth Forum in Rothesay on the first step towards transforming a patch of waste ground into a public footpath. Local youth services workers Simon Kay and Anne Kennovin, and Bute In Bloom’s Jessica Herriot, were joined by a group of young volunteers in clearing thick clutches of bramble bushes from the ground next to the Lade, between Mill Street and Ladeside Street. The next stage in the process is for Bute In Bloom to investigate how the area could be turned into a public right of way, with a path and benches and perhaps more to make the space a pleasant one for the public.